Apartment, renovated in 2013. High quality with lots of charm. Ideally located facing the sea, on the waterfront. Fully equipped modern kitchen, bathroom with shower, spa bath + 2 seater chromotherapy. Outdoor balcony, parking for 2 cars. All shops and restaurants are nearby, you can forget the car. All the comfort you need for the perfect holiday! Ideally located facing the sea, ideal starting point for walks in the fresh sea air or the countryside and to visit all the famous landmarks: Cap Gris Nez, Cap Blanc Nez, Audresselles, Ambleteuse, Wimereux. 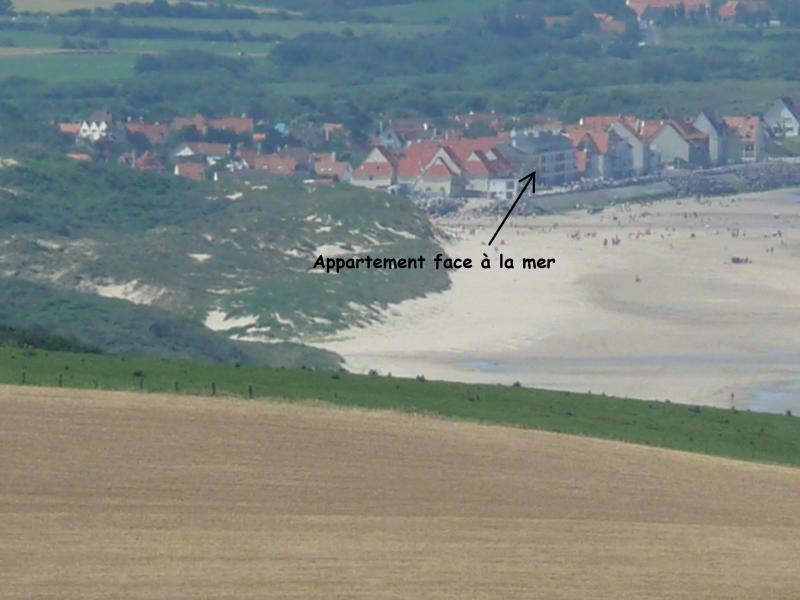 Only 10 minutes from the A16, it will allow you to easily discover the various tourist sites and to access nearby towns: Calais, Boulogne, Le Touquet Paris Plage. First, a very good contact with the person in charge of the keys. Very bright apartment (crossing) superb well secured terrace, beautiful living room and beautiful kitchen. Some finishes to finish (sdb and stay) but nice surprise in general. 2nd floor WITHOUT elevator but not concealed. Wissant is very attractive and the beach "wild " is beautiful. Great weekend spent in Wissant! We were 4 adults and 5 children including 2 babies, the equipment is well studied for a great capacity of occupation of housing. The beach is a few meters away and is accessible by low tide as high tide. 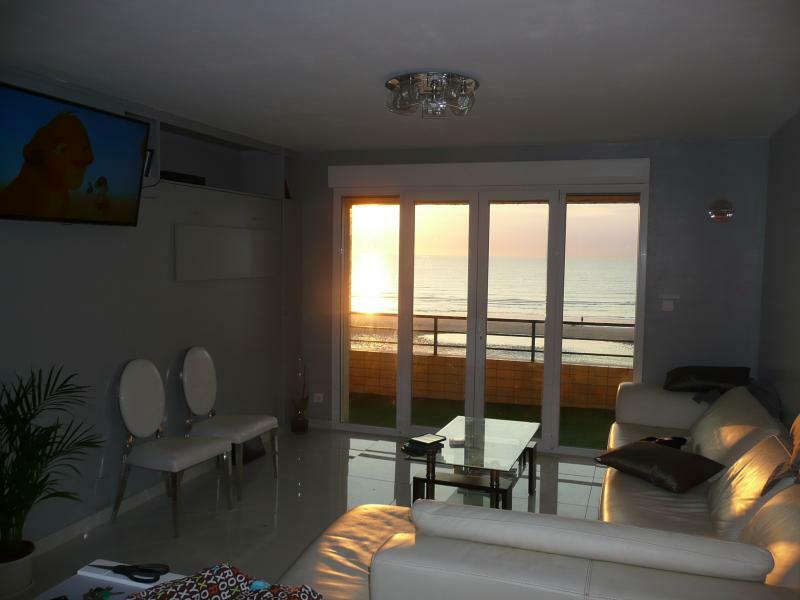 Top rental, really well located facing the sea and in Wissant. Really comfortable, very well equipped, very clean. I will return with enormous pleasure. 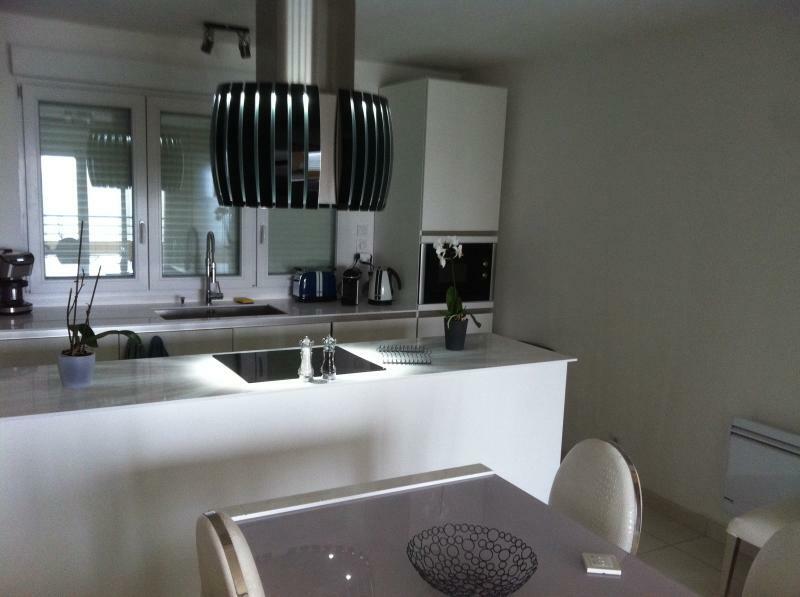 Very nice apartment well equipped at the level of the kitchen and the bathroom renovated. The view between the two headlands is magnificent. Just a little worry about the cleanliness we chose to pay the 70 euros for the final cleaning but when we arrived the housekeeping left a lot to be desired in all the accommodation for our period of stay. Some finishes to check. Anyway we will gladly come back. The apartment was great, well equipped, lots of room and location facing the sea is fantastic. The owner is very nice. Maybe better to include the cost of electricity in the rent and also a better price for cleaning. 70 euros it is expensive. 45 euros is more reasonable. Otherwise everything was perfect !! With the only proviso that the design was too largely supplanted the functional and it is especially at the sink in the bathroom that is absolutely essential to change! Otherwise, nothing but good in terms of furniture and bedding that are very good! Be careful not to let deteriorate decorating this spacious apartment. A stay more than perfect! ... Why? I could make every day in this beautiful kitchen meals more than perfect! tell my family! A very large apartment comfortable and well arranged rooms: the first days of September, nine on Christmas weekend! Between meals walks in the fresh air for the evening a well deserved rest in quality bedding! No complaints! Christine welcomed us beautifully! it is also to report! We will return course! Spacious, well equipped, with superb sea views. We had a very pleasant stay. 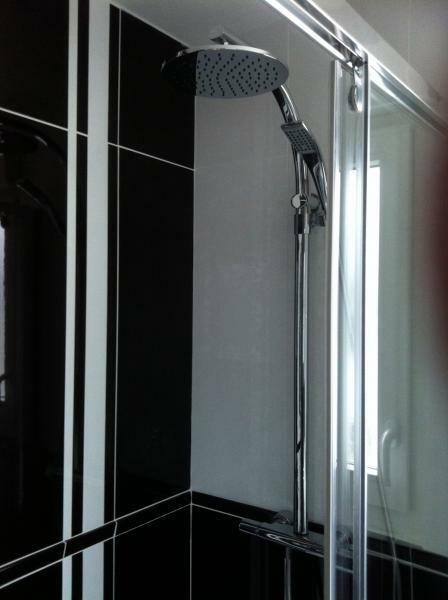 Maybe 3 small minor improvements: storage in 2 rooms provide a shower mat and add some covered. Very nice apartment that I will re-rent for the same period. My little son said very nice bathroom !!! Three minor complaints: no terrace furniture, no two storage rooms and a very slippery mat in the shower. This is only a positive comment! Mr Cornet thank you for putting your apartment to us, everything was perfect, beautiful apartment in a good location. Looking forward to returning, rental advisor. 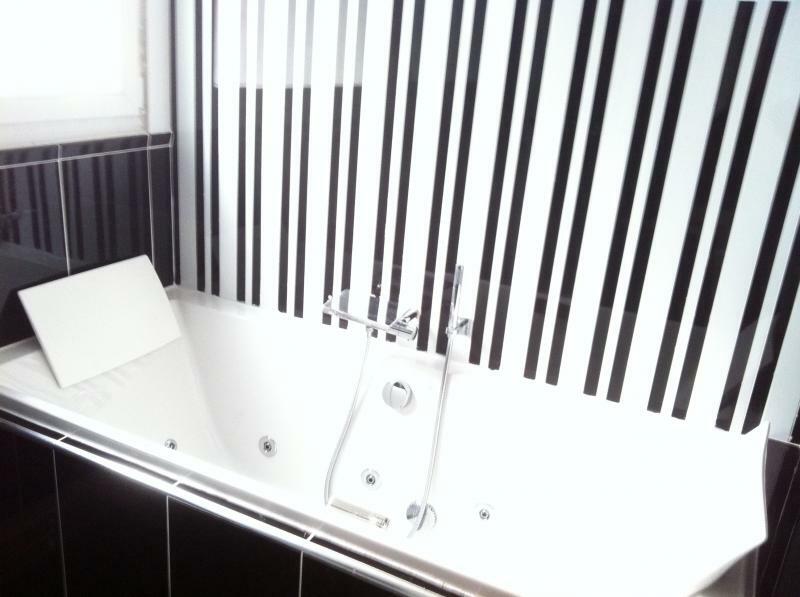 Very nice apartment, very well equipped, ideal for a pleasant stay. I thank Mr Cornet us keep his superb location at our disposal. We spent a great week in mid-November, again, no rain! The various walks in this beautiful area were in our program and comfort of the accommodation to spend pleasant moments with our friends. The view of the British Coasts was there and the clear bay superb. We will get back to re-let your accommodation which fully satisfies us. The reception with Mrs Fontaine was very generous. Very nice apartment, well equipped, with a splendid view. We have greatly enjoyed this holiday. Shame was that workmen were busy on the outside of the apartment with the work in the week that we were there for a few days. But Mr. Cornet has that nice offset. I usually write when I'm not happy, but here it is not the case. I booked last minute and I found a nice comfortable apartment, good bedding, modern kitchen, induction hob, fridge, freezer etc. .., entirely consistent with the description given on Mediavacances. Thank you to Mr and Mrs Fontaine Cornet. Really, no complaints, except that we return with children! We had a wonderful time in Wissant, a long weekend with friends Followed By A Few days just thw two of us. Long walks along rhe great beaches whatever the weather. The apartment was perfect. Everything We Could Have Wished for. Great market in wissant was wednesday nd boulogne on sunday. Cant wait for a return visit. Thank u francois. Amazing views, you can even pay attention to the children on the beach in preparing the meal. Holiday absolutely perfect, thanks in large part to the apartment spotless, wonderful views over the headlands and cliffs of England. I have already recommended this apartment to friends, and having to go back myself. Comfortable apartment with a very nice sea view for living room and bedroom. Have enjoyed beautiful sunsets. Warm welcome by the owner. (A little more would have more closets for storing clothing). Perfect. Completely accurate description. Excellent communication with the owner, lovely. Excellent bedding. The apartment is large and comfortable. The view is breathtaking and without moving you can enjoy the sunsets. Everything is new and nice to use. Quiet and relaxing (late June), close to shops. Grand spacious, new and well equipped. During the rehabilitation of the dam, sometimes actually there could be noise. The walls and ceilings were redone after water damage to the apartment upstairs. Bookings are from Saturday to Saturday for all periods. Pillows, blankets and duvets provided, linen provided.